Homemade Large Spider Decoration– So easy and very frugal! The kids can even help. Candy Corn Banner– This is super cheap to make and very quick. Glow Sticks– Put them in lanterns on the porch, jars or anywhere! These can also double as party favors! 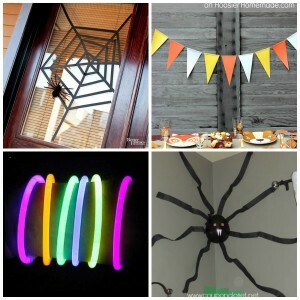 Spiderweb Decoration for Front Door or Window– Use black craft tape for this! 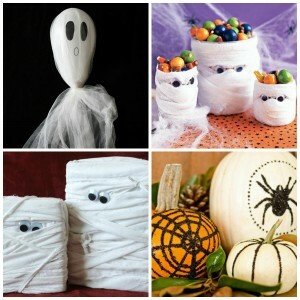 Mummy Candy Holder– combine cheesecloth and cottonballs and you have an adorable candy holder. Aren’t these adorable? Black Glittered Pumpkins – these kids can do this. Mummy Decorations– this uses old cereal boxes, so it is a great way to recycle and spend no money. What’s a party without games? 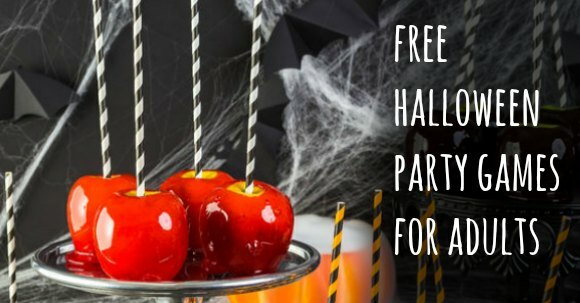 Here are several fun and easy Halloween party games that are cheap (and even free) and can be quickly put together. 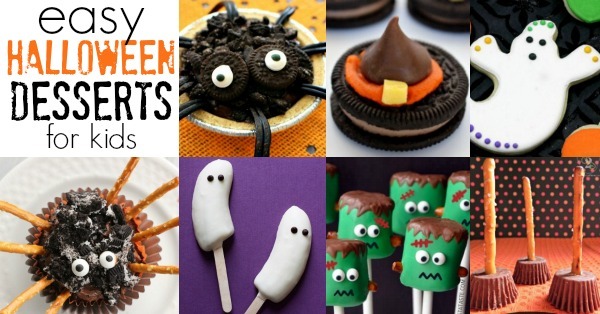 You can find several ideas for ALL ages. 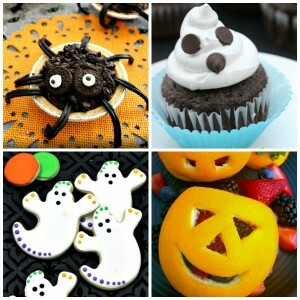 Fun Fall Crafts– The paper plate pumpkin activity would be a cute one for a Halloween Party. 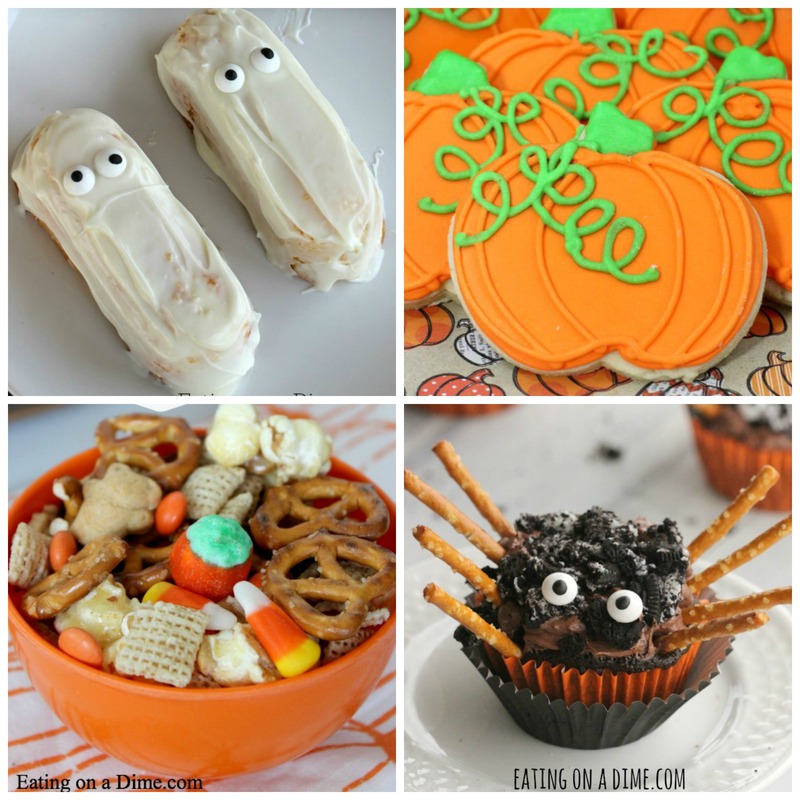 Easy Halloween Dessert for Kids– Lots of easy snacks using food you probably already have. Kid’s love party favors and we have several non candy ideas that are mom approved! I particularly like the glow sticks because they can be used for multiple activities. 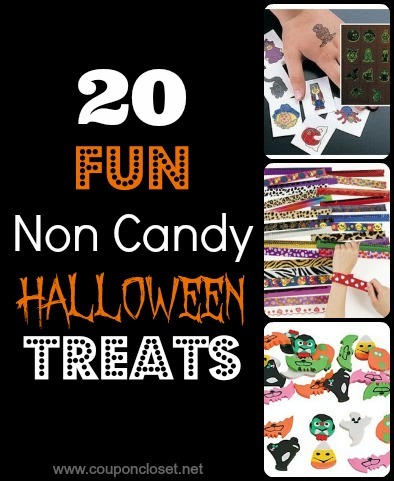 20 Fun Non-Candy Halloween Treats– lots of ideas from play-doh and tattoos to stickers and whistles! 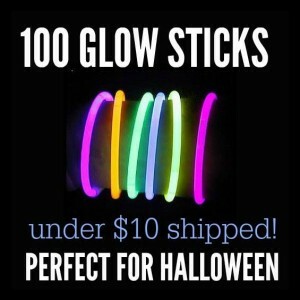 Glowsticks– So fun and kid’s can use these for trick or treating too! We always pass these out. 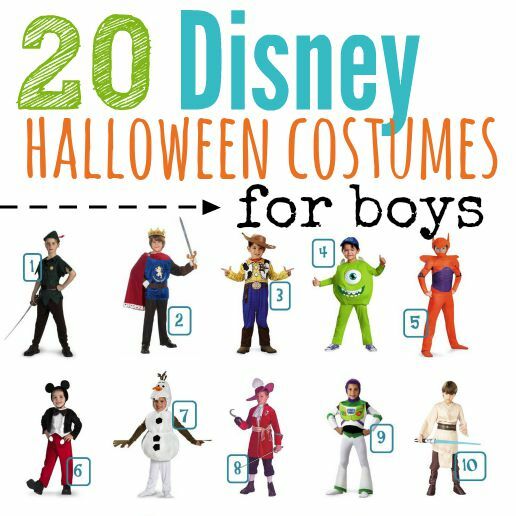 Halloween Costumes can be pricey but I have lots of frugal homemade options for you here! Encourage your guests to make their own Halloween costumes and even consider throwing a Homemade Halloween costume contest, so your friends don’t feel they have to spend a fortune on a Halloween costume. 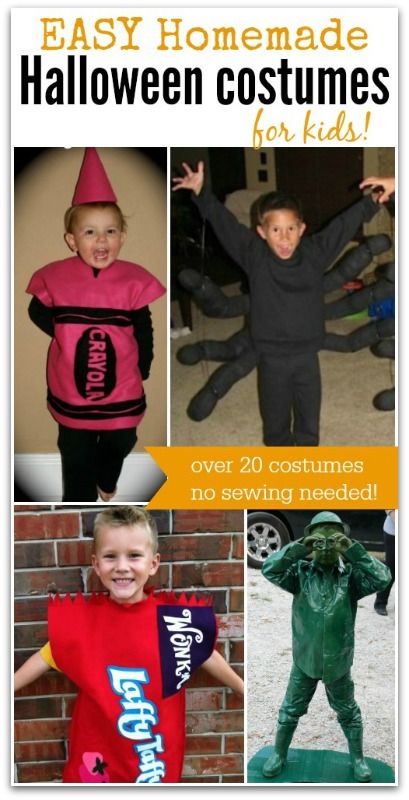 Homemade Halloween Costumes for Kids– so many options from Laffy Taffy to 50’s Halloween Costume and spiders and more! Not Crafty or short on time? Purchase a costume for a great price. 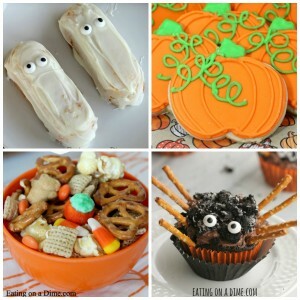 Easy tips for a Halloween Party on a Budget. 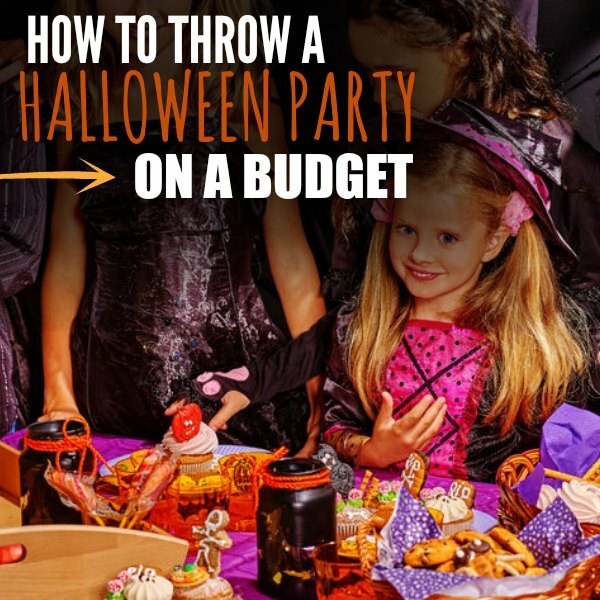 I hope these tips will help you throw a super fun and easy Halloween party on a budget this year for your family. 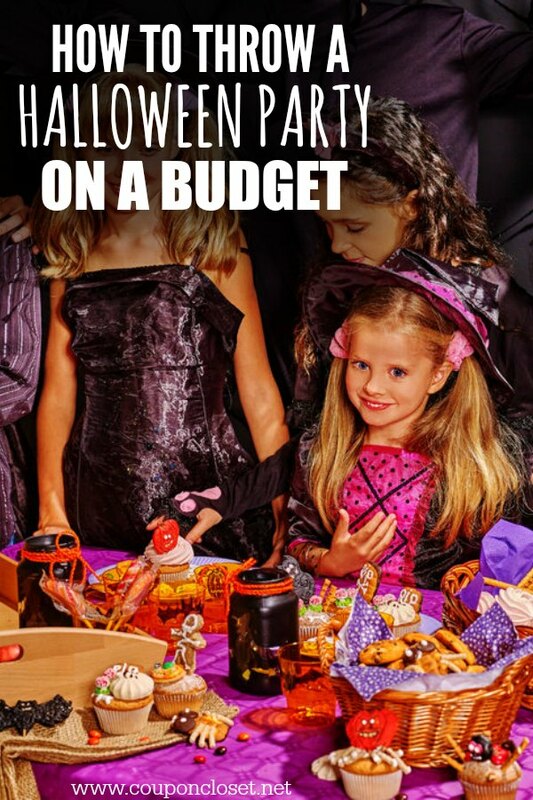 Do you have any tips to add for a successful Halloween Party on a Budget?